A GLADSTONE man who trashed a Calliope rental, forcing the owner to claim more than $30,000 in damages, was sentenced to jail on Tuesday. Peter James Paterson appeared via video in Gladstone Magistrates Court and pleaded guilty to two counts of wilful damage. Paterson, 30, was already in jail for drug offending and set for parole in 2021. The offending at the Calliope rental home occurred sometime in the months before October 4, 2017 and before he was sentenced for the dissimilar offences, the court was told. Paterson and his girlfriend had entered into a rental lease for the Calliope property in May 2017. Police prosecutor Joel Sleep said the house was in "good order" when supplied to the pair. He said that on August 18, 2017 the owner of the property attended the home to carry out an inspection and discovered significant damage to the property. By October 4, when another inspection was completed, Paterson and his partner had left the property. 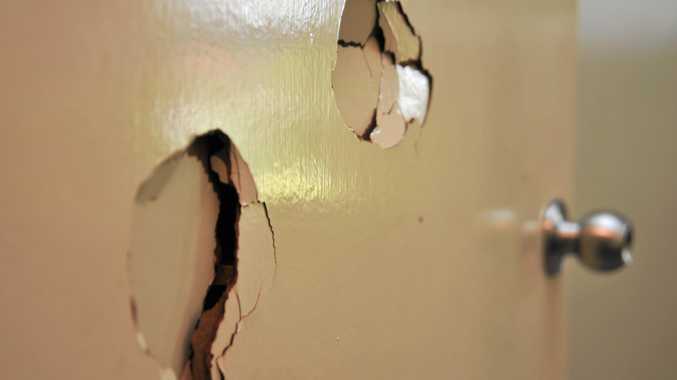 The owner was confronted with further significant damage, including several 20-30cm holes in the plaster walls of multiple rooms, ripped wallpaper, dents in a wall, splashed paint on the walls, and a 20cm hole exposing live wires in the bathroom. The court was told eggs had been thrown at the garage of the property and there were 2-3m of burnout marks on the driveway. Magistrate Dennis Kinsella asked a smiling Paterson whether he thought there was something amusing about his offending. Several members in the gallery of the courtroom, believed to be Paterson's associates, were also told to stop laughing. "This in someone's house ... they have put money into this property and it's not a laughing matter, do you understand?" Mr Kinsella said. Several other members of the gallery applauded Mr Kinsella. The court was told the home owner had filed an insurance claim for more than $30,000, but those matters were proceeding in another court. Mr Kinsella noted Paterson was already serving 51/2 years for drug trafficking and imposed a three-month jail term to run concurrently with the time he was already serving. A conviction was recorded. Paterson is set for parole release on February 21, 2021.